Melbourne four-piece, The Flying So High-Os, are gearing up for a big year, starting with their very first New Zealand tour. Having spent the last few years on the Australian tour circuit, including shows alongside Australian staples such as Camp Cope, Jess Locke and The Smith Street Band, and international bands They Might Be Giants and Jeff Rosenstock, the hard-folk outfit are ready to head across the ditch. Drawing from a wide spectrum of influences including punk, indie, folk & reggae, The Flying So High-Os have honed an original sound with strong pop sensibilities. Stirring melodies paired with darker, polarising lyrical layers are the group's trademark. The Flying So High-Os have just finished recording a new album with Michael 'Fitzy' Fitzgerald (of The Smith Street Band and Pool House Records), which is due out later this year. It is set to be their most focused musical output yet, raising the bar from their previous releases, split EP, In Describing The Motion Of Indescribable Bodies, and debut album, Life As A Common Noun. 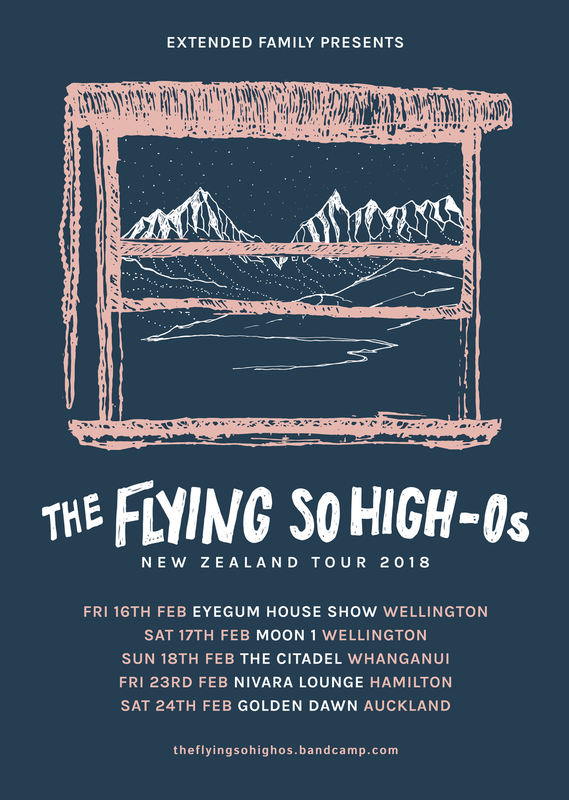 The Flying So High-Os will be touring New Zealand's North Island for the first time this February. Supports to be announced soon.